Dimensions: 7 1/2" x 9"
This book lives up to its title and more! Filled with over 900 detailed black and white photos, this book features more than 1500 patterns of early American pattern glass from Aberdeen to Zephyr. Originally written in the late 1950's, this book has left the original format and fascinating commentary intact, but now features even more updated information from a committee of expert EAPG collectors and dealers, as well as updated values. It also includes information on reproductions, bargain patterns, terminology, uses, rarities and more. A complete index is in the back for help in identification. 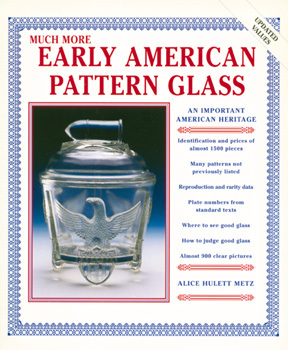 This new edition of an excellent guide is now even better than ever, and a must-have for any collector or fan of Early American Pattern Glass.